5:30. Parka came out to congratulate the new trios champions. OGT interrupted, attacked, and took out Vikingo with a martinete. Parka challenged the OGTs to an immediate match. Averno pulled of Parka's mask for the DQ (though he first pulled off the top of his mask and had to scramble to get the rest.) The other tecnicos were unmasked as well. 14:34. New champion, Drago win the Dragon's Tail cradle. Fantasma falls on his 5th defense, 4th on TV. Drago is the 9th champion. 10:13. Kross & Demon pinned Wagner after a Demon Devil's Wings (and Hijo del Tirantes messing up the count at first.) Scarlett was with Kross and interfering. That brought out Vampiro to grab her, only for Kross to hit Vampiro from behind. Vampiro left holding his neck. 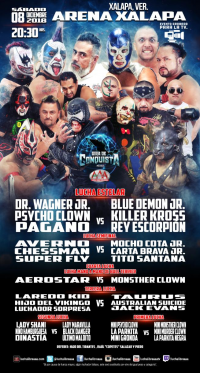 Event Notes: A scheduled Fenix vs Cage match for the AAA megachampionship did not take place. Fenix was hurt in his last CMLL appearance and Cage picked up an injury a couple days before the show. Cage sent in a video to apologize. Fenix appeared to apologize. Laredo Kid interrupted to ask if he would still get a title match, and Fenix said Laredo was on top of his list once he came back. 9:36. Nino Hamburuesa splashed Parkita Negra (debut) and Ultimo Maldito. La Parkita also debuted. 8:36. Star Fire pinned Maravilla with help from Tirantes and challenged her to a title match. 12:07. Laredo beat Jack Evans. 11:02. Aerostar touched all four corners. Monsther Clown attacked and unmasked after bloodied him during the match. 14:52. Carta Brava Jr. beat Super Fly with the Air Raid Crash. OGT offered respect, then attacked Poder del Norte after the match. 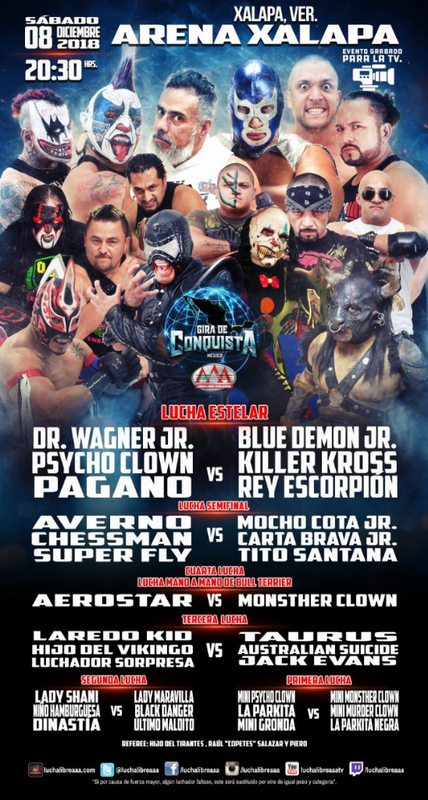 Event Notes: announced on 09/16 AAA Xalapa show.